The Hawaii Department of Transportation (HDOT) Highways Division reports that the emergency repairs on Hawaii Island of damages caused by the Kilauea East Rift Zone Eruption (May to September 2018) and Hurricane Lane (August 2018) have been completed. During the Kilauea eruption, daily earthquakes caused severe damage to Mamalahoa Highway (Highway 11) between mi. markers 28 and 32 in Volcano. HDOT first used Ground Penetrating Radar (GPR) to determine the nature and extent of damage to the highway at specific locations. Repairs were extensive and involved 24/7 lane closures that enabled reconstruction of the roadbed from depths up to 10 ft. In February, upon completion of site-specific repairs, a follow-up GPR survey was performed for the corridor between mi. markers 28 and 32. The GPR survey confirmed that all subsurface voids and cracks of concern under Mamalahoa Highway were properly repaired. As a result of Hurricane Lane, the HDOT Highway system sustained significant storm water damage from a record 50-in. of rain. The newly constructed Daniel K. Inouye Highway (Highway 200) between mi. 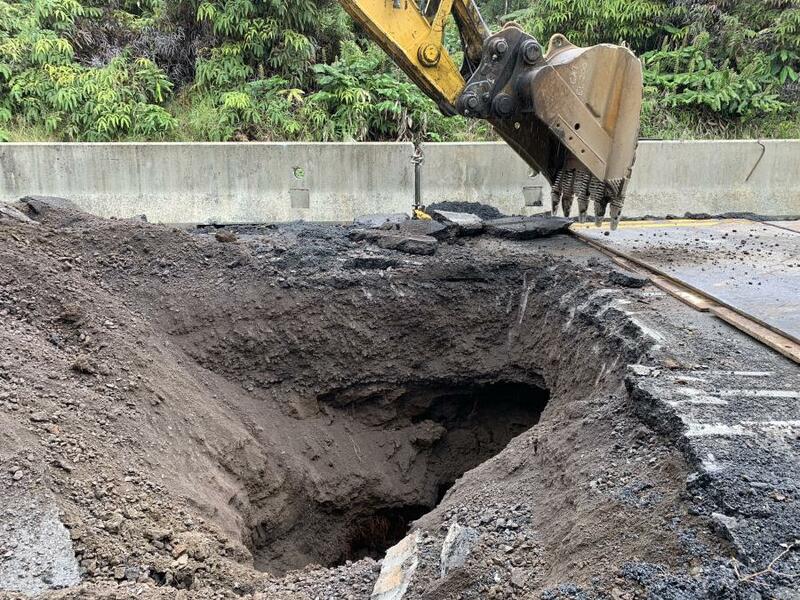 markers 8 and 11 and Mamalahoa Highway (Highway 11) in the vicinity of Kurtistown and Mountain View experienced severe road and drainage system damage due to the sheer volume of runoff within such a short time period. All drainage systems have been repaired. The Hurricane Lane storm water also caused numerous landslides and embankment failures. 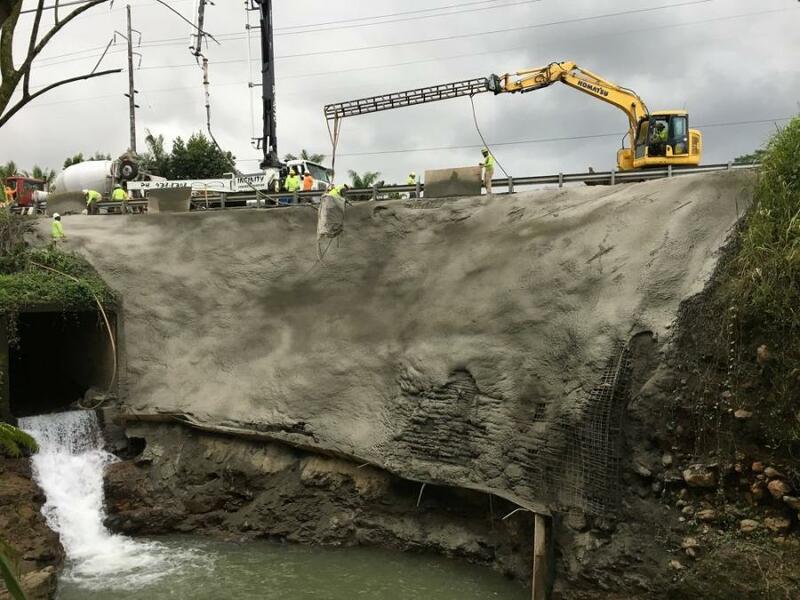 Surface water flow caused landslides along Hawaii Belt Road (Highway 19) that threatened several residential structures at mi. markers 3.2, 3.6, 6.6, 7.1 and 15.6. The most severe landslide occurred at mi. marker 7.1 at the State Right-of-Way (property line) and required construction of a mechanically stabilized wall. Other earthen slopes were restored and hardened with masonry. Surface water flow from adjacent private properties and an overflowing Makea stream exposed boulders in the roadbed of Hawaii Belt Road (Highway 19) and a landslide exposed a nearly 50-ft. cliff at mi. marker 11. Both the exposed boulders and cliff were stabilized using a system of 30-ft. long soil nails and covered by cementitious shotcrete material. Similar high water flows at Kapue Stream eroded the foundation at Kapue Bridge, Hawaii Belt Road (Highway 19) mi. marker 6.53. 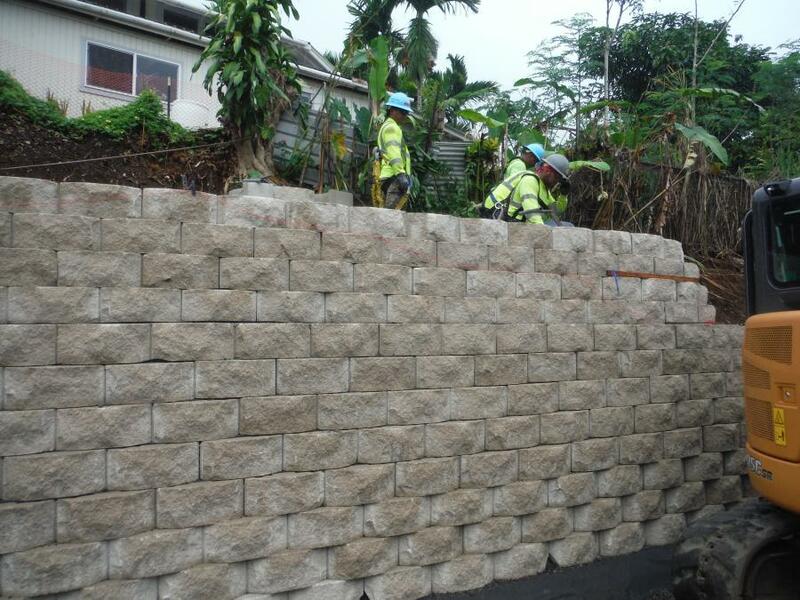 The contractor used masonry to stabilize the foundation and surrounding area to protect from future water erosion.